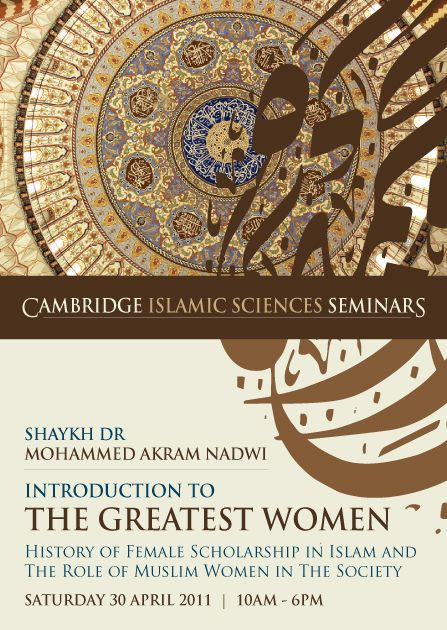 Cambridge Islamic Sciences: What is The Role of Muslim Women in the Society? What is The Role of Muslim Women in the Society? The Role of Muslim Women in the Society is one of the most misunderstood concepts of Islam among the Muslims themselves let alone non-Muslims. So many over-cautious non-Islamic practices have been integrated in to various Muslim cultures so much so that many Muslims think that those practices are part of the religion. Unfortunately this is very rampant when it concerns women as the Muslims have lost touch with their own rich and empowering traditions. As a reaction to this there is a tendency among certain segments of the Muslim society to totally reject the Muslim traditions and wholeheartedly embrace ideas and values espoused by "women's liberation" and feminist movements. So what is the alternative? Shaykh Dr Mohammed Akram Nadwi is presenting a historic and rare seminar on this very same subject. The seminar looks at the role of Muslim women in the society throughout the Islamic history from the time of the Prophet Muhammad until the present century, comparing and contrasting how and why things changed with time. It is based on his ground-breaking research in to the often neglected history of female scholar of Islam and the role of Muslim women in the society. "This is a rare, empowering and historic seminar that no Muslim (or even non-Muslim) male or female can afford to miss"